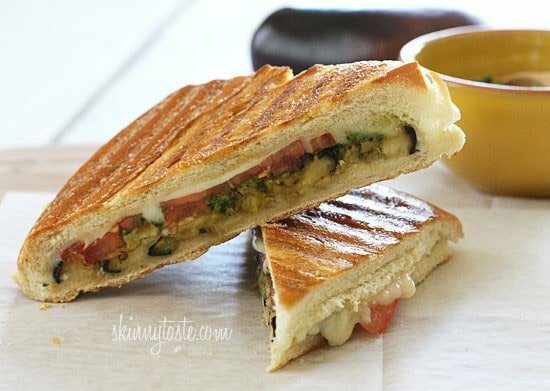 A perfect summer lunch panini made with eggplant, tomatoes, mozzarella and skinny pesto on crispy French bread. 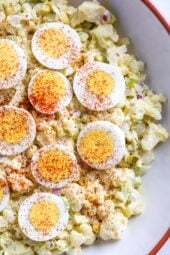 Make this for one, or for the whole family. My friend gave me eggplants from her garden, and I used it to make this delicious hot pressed sandwich. If you can find a whole wheat baguette, even better! I love, love, LOVE Panini night in my house because everyone is happy and they are so easy to make. If you’re capable of making a grilled cheese, then you can make a panini, that’s how simple and you don’t need a fancy panini press to make it. Prior to owning my panini press, I used my George Forman grill or made them on the stove in a grill pan with an iron skillet on top to press it down. I grilled the eggplant right on the panini press, so there’s no dirtying extra pans. A perfect Meatless Monday dish, and even the meat-lovers in your house will enjoy this sandwich. If you’re a newbie to Skinnytaste, check out my tip on how to make a larger sandwich for less calories. If you are making this for one, simply divide the ingredients by four. Slice the eggplant into 1/4-inch thick slices. 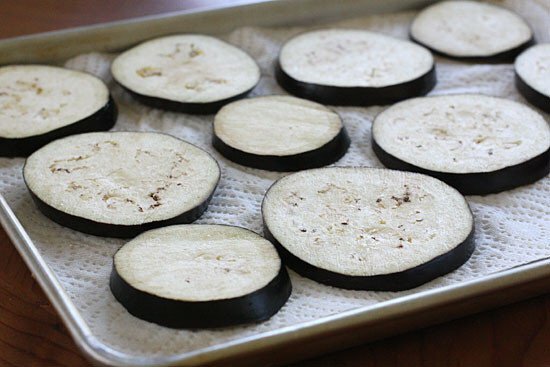 Place the eggplant slices on a paper towel and season with salt; set aside about 30 minutes. This will help draw some of the moisture out of the eggplant. Pat the eggplant dry with paper towels. Lightly spritz eggplant with olive oil, season with salt and pepper. When the grill is hot, grill eggplant about 7-8 minutes, turning once half way through. Slice the bread open and place 3 slices of grilled eggplant, 1 slice of mozzarella, 1/2 tablespoon of pesto, and 2 slices of tomatoes on each sandwich. Close and lightly spray the top of the bread with oil. Place on a panini press and close until the cheese melts and the bread is toasted. Cut in half diagonally and eat immediately. Delicious little sandwich! We love to have one or two meatless meals a week and this fit the bill for a quick weeknight meal. We used a Breville Panini Press and it came out perfect. Just finished this sandwich. It was ABSOLUTELY delicious!! I grilled the eggplant and made the sandwich all on my cast iron griddle. No fuss, no muss, and an absolutely delicious meal that makes me look forward to tomorrow’s lunch when I can have it again! So good. I added sliced baby bella's to mine. After washing the eggplant, cut lines in the eggplant (like fancy carrots or radishes). Then cut the eggplant. This makes the eggplant skin easier to chew. You will get lots of the nutrition from the skin. We have made this twice, and love it for a quick Sunday afternoon football meal. Also, a nice way to use up the late summer tomatoes. I used fresh basil from my deck. Delicious! I made this last night and my whole family loved it! My husband is a new vegetarian and he took the left-overs for lunch today! I can't wait to make this again… probably next week! : ) Thank you! Could I freeze these sandwiches? Could I reheat in a toaster oven after defrosting? Having an all Skinny Taste dinner week. Made this one last night. I have a basil garden so made fresh pesto. The family LOVED them. My son, who moves out for the first time tomorrow, made the comment "NOW you find this recipe!" LOL I told him he's going to have to learn to cook! I have never thot of using eggplant in panini! Brilliant! I feel obsessed with eggplant lately! what a great way to use it! The bread in the original picture does not look like the same bread in the picture farther down. Is that first picture really a 9-point sandwich? Or is it two 9-point sandwiches? The one further down (it's pictured open) looks like a much smaller serving. Same exact bread, those photos were taken step by step, it looks different after it's toasted and pressed. One sandwich, 9 points as pictured. Cut it on the diagonal, looks bigger after. 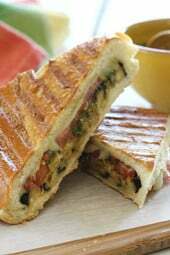 I have been making Panini's for years,,,I used to make three different kinds for my Mom ( RIP ) she loved the eggplant one that I made as well as the meatball ones. Love your sandwich too Gina!! I have used all of the methods listed above instead of a panini press and I have to say, nothing compares to the crispiness that the panini press creates! This looks incredible. What an amazing summer sandwich. YUMMMM…I made this Monday night for meatless Monday, and had enough to make for lunch again today. SO GOOD!! I would recommend peeling the eggplant, at least stripe peeled, since the skin seems to stay a little tough…very very good. How much is 12 oz of french bread please? You really need to weight it. I received Eggplant, Basil, French Baguette & Tomatoes in my co-op basket this week. I had the rest of the ingredients for this & the pesto at home. THIS IS SERIOUSLY GOOD! I can't believe I waited so long to try it! Hubby just got a panini press for Christmas and I have been really trying to make use of it. 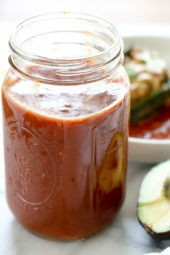 This recipe is amazing!!! I just had a leftover for lunch and even cold it was fantastic! The pesto is delicious and I used a little extra garlic just because I love garlic. I never had grilled eggplant and I had a hard time not eating it all before it ended up on the sandwich. Any idea how to make the eggplant without the salt? I am trying to lower my sodium intake thanks! This was yummy but I used Parmesan , Romano, asiago shredded cheese that I had on hand from making stuffed mushrooms the other day and it came out great. Super easy to make. I subbed red pepper hummus for the pesto as I'm not a huge fan of basil, and it was SOOOO good. I have to agree with my husband. Tastes like it's very bad for you, lol. Pesto was not as liquid-y as I expected but delicious and flavourful! I love the method of placing eggplant (being British I still cannot get my head around calling it eggplant!) on paper towel before grilling, and using the panini maker to grill worked really well and was much healthier than my usual method of frying with copious amounts of oil before baking. Overall I really enjoyed the sandwich, and the only change I made was using 1 slice of fresh mozzarella which was delicious! For the baguette I used Whole Foods organic wheat, took filling out as skinnytaste recommends. Great trick as I prefer crust of baguette to bread anyway and you get more filling that way :). I found this on pinterest and cant wait to try more recipes – when are you coming out with a cookbook?? OMG!!!! That sandwich was AWESOME!!!! One of the best I have ever made "at home"! Basil for pesto right out of the garden and tomatoes and eggplant too! I used a focaccia bread and it toasted up nicely in the pannini press!!! I will be using the rest of the pesto for the pesto grilled shrimp later in the week! I just made this for dinner tonight and it was fabulous!! Both the pesto and the eggplant were so delicious! We had leftover eggplant and ended up eating it like chips :o) Will definitely be making this one again soon. Just made this for dinner with all fresh ingredients from my garden plus some asparagus too. So very yummy! Can't wait to try more of your recipes, the handful that I have made have all been great!! made this for dinner tonight, using fresh basil for the pesto and fresh tomatoes…yum! This looks great, I had some baby eggplants, so I made what I call Slider Paninis, and because I am vegan I used nutritional yeast to replace the cheese in the pesto,and Rice cheese in the sandwich. Thanks so much, your recipes inspire me. Made this last night for my daughter and her friend. They loved it, both had two panni's each and I made it without the press, just baked in oven…was great recipe, didn't know making pesto could be so easy. Thank you Gina for all your great ideas! Wow!!! This looks fantastic my mouth is watering just reading about it! Can't believe you can do this to eggplant! Very smart! So delicious! Thans Gina love your site! I am a weight watcher member down 50 plus pounds your recipes make my life style change easier! This sandwich really looks yummy. As soon as I go to the market, I'm going to make sure,to buy,eggplant. This is great to have for,breakfast,lunch,or diner. Thanks for sharing! Farmers Market's tonight, I will be picking up some eggplant and fresh bread!!! Neither eggplant nor pesto interest me in the least, BUT it gives me a good starting point for sandwiches I would enjoy. Never would have thought to use the George Foreman grill for a sandwich, but it's perfect! Thanks! What an amazing idea! You can even leave the cheese out with the eggplant, it still gets this chewy taste. This one is bookmarked for next weeks mealplan! Wow. I just made this for dinner and, I've got to admit, I was tempted to add some mayo or something on one of the bread sides. I kept my cool and made it as directed. Absolutely great. Love your stuff, Gina. I can't cook enough to make all the things I want to make. Okay, you got everything I love in one sandwich: pesto, eggplant, and cheese…plus it's all grilled until golden brown perfection. I'm really happy right now. 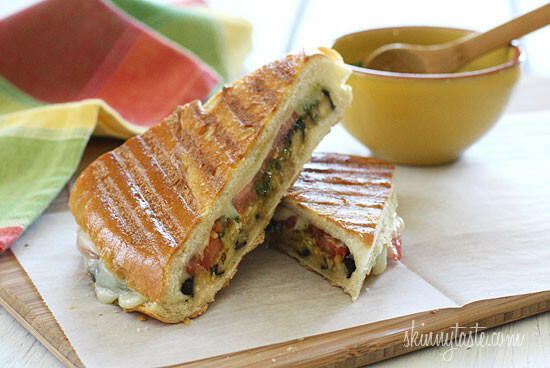 What delights of panini with eggplant. I loved it because it is tasty and healthy too. Beautiful pictures. 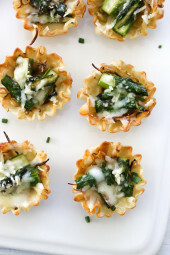 Definitely making these tonight! question- when I put the nutrition information into my calculator I get 8 pts+, as opposed to 9 pts+ listed. Did you add a point for something? I use recipe builder for points, sometimes there are discrepancies so to be sure, I made it 9. Thank you! Thank you! Thank you! I have an over abundance of Eggplant AND Basil in my Garden! This is now on the menu this week! I planted 6 eggplant this spring. Two weeks ago I harvested 77 Japanese eggplant… last week 28. I need eggplant recipes! Thanks! I'm making this tonight! Super excited about it! Just convinced hubby that eggplant isn't evil and I have a sandwich press that I haven't used in *years*- can't wait to try this recipe! 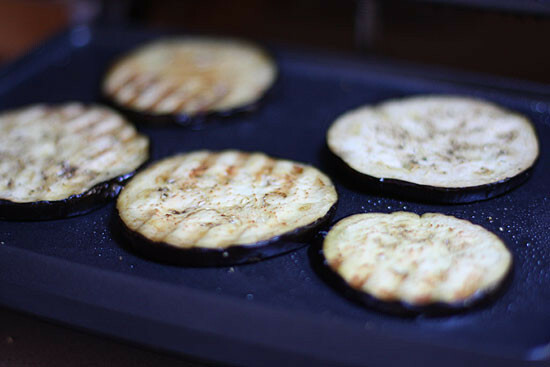 I ♥ grilling eggplant when we cook out. This would be a fabulous use for the "leftovers." Since I am the only one who actually eats eggplant at my house, it would be ALL. FOR. ME! Wow, I actually have all the ingredients in the fridge right now. I just made homemade pesto yesterday and I've been trying to figure out what to do with the eggplant I got from my CSA. This is perfect. I will have to make this for dinner! What kind of bread did u use in the picture?? It was a French bread loaf. I always eat sandwiches like this <3 i adore it! I'm not an egg plant fan but this sandwich looks marvelous! I'd love to try it and the pesto, yum! Neither is my husband but he loved it. The pesto makes it!! This looks delicious. I had something very similar for dinner last night with zucchini. Also very yummy. I have a great tosti maker that can double as a panini press but I have been wondering how to make a proper panini because we didn't have the proper bread… How easy is it to just use a baguette! Kind of facepalming myself right now for not thinking of that. You said this works good with a george forman? I have had one for awhile but haven't used it. I am scared to try it! I have seen so many roasted veggie things I want to try but am nervous about using the george forman for it…any tips? Just do it! You really can't mess it up. I think eggplants are sadly underutilized. I loved them (had some for lunch today). I will try the sandwich I don't have skim sandwich, but I have soy mozzarella, so I am going with that. This looks so delicious! 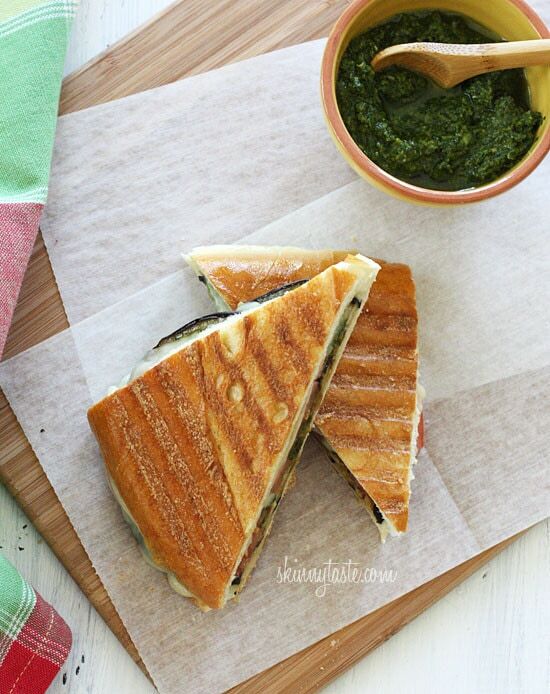 Pesto and vegetables in sandwiches is yummy! Oh my gosh! This really is the perfect meal! I can hardly wait to try this! This looks so good! I wish my daughter wasn't allergic to eggplant. This panini would totally be on the menu soon! This is awesome! I think I can officially say that you're one of my favourite bloggers. I love your skinny recipes! This looks absolutely amazing!! I love anything eggplant! I'm always so scared to try eggplant but this looks like a great way to do it! We love eggplant but not the salt and roasting process. Much quicker: Slice the eggplant, and steam slices in a vegetable steamer basket inside saucepan until tender. This sometimes takes as little as 5 minutes for a garden eggplant, and it doesnt heat up your house the oven. Roasted eggplant drizzled with olive oil is a finer result, but for an ordinary meal steaming works fine to get the eggplant cooked. That looks so freakin' good! I love eggplant, I don't know why I so often forget to pick it up at the grocery store! I'm always so nervous to try eggplant, but no matter what it always tastes great! A little slimy, but maybe I've just been doing it wrong. Def trying this one! This looks delicious! I just made your pesto today and had some for lunch it was fantastic!! Great alternative to a meat panini and eggplant is delicious. This looks so good! I'm going to have to try my hand at making paninis without a press! I use my George Foreman! This looks so delicious! 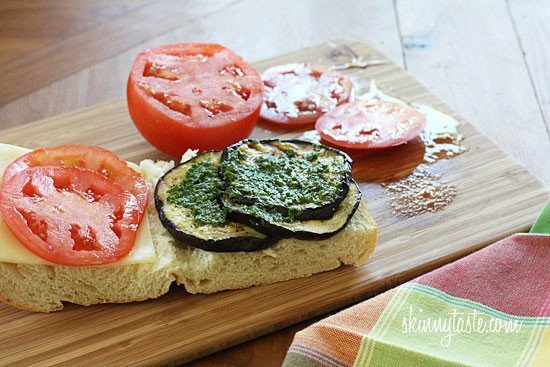 Love eggplant and pesto, would be even better together! I may have to invest in a panini press, or grill pan.